How do I compile that code? This is an in introduction to programming of AVR microcontrollers using C as a language. The avr-gcc was originally developed for Unix systems. Today it is available for almost any system and very widely used. This article will therefore also cover Windows. The setup on a Mac is almost identical to Linux. Computers become smaller and more powerful. This has lead to an ongoing revolution in the world of analog and digital electronics. Not so long ago we were building circuits with dozens of TTL chips and many analog components. Todays circuits don't look like that anymore. They have just a few analog or digital components at the input or output (e.g an amplifier) and then there is one chip with many pins. Those chips are however not application specific ICs. Those are usually generic microcontrollers. More and more components are just replaced by an algorithm and that algorithm runs probably inside a microcontroller. Microcontrollers are at the heart of this electronic revolution. It is a very exciting revolution and it is fun to play with those microcontrollers. Come and have a look! A microcontroller is a small single chip computer. It has CPU, Ram and permanent data storage on one small chip. They als have build-in counters and analog to digital converters (ADCs) on chip. This makes it possible to replace analog circuits with a microcontroller and some software. AVR microcontrollers are named after two Norvegian students (Alf-Egil Bogen and Vegard Wollan) who invented them. AVR stands for Alf and Vegard's Risc architecture. 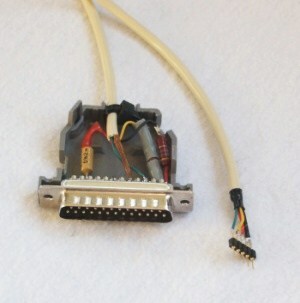 Today the AVR microcontrollers are produced by Atmel (http://www.atmel.com/products/avr/default.asp), a US company. This AVR architecture makes it quite easy to program the chip in C. The avr-gcc development environment is available as free software. Learning by doing is probably the best way to learn. So let's start with a straight forward and easy to understand circuit. You might have heard about Astable Multivibrators. It's an analog circuit that can be used to get a LED to blink. Let's replace it by a microcontroller. It's the "hello world program" equivalent in the microcontroller world. To replace an Astable Multivibrator is of course not a big advantage because the complexity of an Astable Multivibrator is not much higher than the equivalent microcontroller circuit but the microcontroller circuit can easily be extended with more LEDs. You can easily get all those LEDs to flash in different patterns, something that would be difficult and complex with an analog circuit. 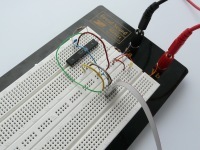 You can build this circuit on a dot-matrix board or even a breadboard. AVR microcontrollers have a built in clock. They don't necessarily need an external crystal. Breadboards can be used for most microcontroller circuits that do not require an external crystal. Programming involves basically 3 steps. Writing the software (1). Compiling it(2) into machine loadable format and loading it (3) into the microcontroller. The software for our test circuit is already written. Therefore let's first focus on how to get it into the microcontroller and later we discuss how to write software. A programmer is needed to program a microcontroller that comes fresh from the factory. This programmer consists of both software and hardware. The hardware interconnects your PC with the microcontroller. The programmer software that we will use is called avrdude and it is available for Linux, Mac and Windows. It is a command line controlled programmer but if you prefer mouse clicks then you can just write a script (batch file) and include the command there. Double click on the batch file and the programmer loads the software into the microcontroller. If you have a PC which still has a parallel port and runs Linux then you can just build your own programmer out of a simple cable and three protection resistors. 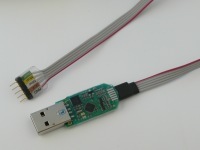 Most people would probably like to use something that works with any operating system, connects via USB and works also with circuits that run not on 5V. Many microcontroller circuits run e.g on 3.3V. The tuxgraphics avrusb500 is e.g such a programmer. The command line option to let avrdude know that you will use this type of programmer is called "-c stk500v2" and you have to specify with the option "-P" which is the equivalent com-port (or device in /dev for Mac and Linux). It's very easy and there will be more details further down. We have now discussed the programmer hardware and I mentioned already that there is a programmer software called avrdude. Both hardware and software work together to get the code into the microcontroller. How to install C-compiler and this programmer software is described in the article Building your own avr-gcc environment with atmega328p capabilities, Linux. This article has also a section at the end for Windows and Mac. Ready to use packages are available for Windows and Mac. It's just a matter of downloading and installing them. Download the avrledtest software at the end of this article. Power up the circuit with the atmega8 (Interestingly many people tend to forget that. Electronic circuits that work without electricity are not invented yet ;-). COM4 would be the equivalent comport emulated via USB. You get this information from the hardware device manager under windows. Mac and Linux will tell you in the kernel messages what devices to use when you plug in the avrusb500 into the usb port. To find the right /dev device after the avrusb500 was just plugged in you run the command dmesg and you see the kernel messages. You can also include the device name into the avrdude.conf file and then you do not have to specify it on the command line. Look for an option called "default_serial". Of course it does not harm to use a script under Mac or Linux if you like. You could also include the command in a makefile (we get to that later). avrdude: reading input file "ledtest_pre.hex"
... and you have successfully loaded the microcontroller with software. Congratulations! The LED is connected between Vcc (+5V) and the pin PC5 of the microcontroller. To switch the LED on the pin of the microcontroller needs to go to 0V (GND) and to switch it off it needs to go to +5V. We could have also connected the LED between GND and PC5 however the output drivers of the microcontroller can handle more current when pulling a pin to GND. With the LED connected between Vcc and PC5 we have a current flow when the microcontroller output pin goes to GND (0V). Now we understand what we want to do and it is just a matter of finding the right commands/functions. Since we are programming hardware related functionality it is always good to have the datasheet at hand describing that hardware: atmega8 datasheet, pdf, 2846392 bytes. What we want to do is described in chapter "I/O Ports", "Configuring the Pin, page 52". The microcontroller has a data direction register (DDR) by setting a bit in that register to one we configure the corresponding pin as output. There is also a PORT register where one can set a bit to switch the output of a pin on or off. How to set specific bits in those registers? This is a compiler/avr library specific question. It would be documented under "IO definitions" the avr-libc documentation (avr-libc 1.6.4, modules). It is implemented in the current avr-libc-1.6.X as something that looks like a variable. In older versions (version 1.0.X) it used to be implemented as a function (sbi and cbi). The names of those "variables" for atmega8 are found in the directory tree of your avr-libc under <theRootDirOfAvrLibC>/avr/include/avr/iom8.h. What we need is DDRC for the data direction register on port C and PORTC to access the port C registers. There are also constants defined in this iom8.h file which can be used to write to a specific bit position (PORTC5 or DDC5). The C syntax to set a bit at position is "|=(1<<...)" and to write a zero would be "&=~(1<<...)". It might look a bit strange the first time you see this but you don't really have to understand it. Just note it down and copy/paste it as needed into your program. You can download the full code at the end of the article as avrledtest. There are a few things that are strange about this code when you are new to microcontrollers. The most obvious one is the while(1) statement. All microcontroller software has this endless loop in main.c. We don't have any operating system running here and we don't have a need to terminate the program. The while(1) is akin to an operating system which would step one after the other through all the tasks/processes that need to be done and run continuously every task a little bit. the main reason is however that _delay_ms makes the code very fat and you will quickly fill up the flash memory of your microcontroller just by calling that function a couple of times. My own delay_ms uses internally also _delay_ms but just in one place. You can find the complete code for avrledtest in the download section. Once you have understood this simple program you will find that much more complicated applications are not really more complicated. It is all about reading the state of some IO-pins or changing IO-pins according to a certain pattern. The first line converts ledtest.c into the object file ledtest.o. The second line links the objects into ledtest.out. If you have a project that consists of more than one C-code file then you can use this to link all the objects together. The third line makes then a .hex file which can be used to load the software into the microcontroller. The last line is to check the size of the code. This way you can easily detect inefficient code and take action. Integrated development environments are meant to make programming easer. avr-eclipse is e.g such a solution. My personal opinion is however that those IDEs just limit you to the ideas that the developer of this IDE had. It looks like it is easier simply because it looks nice but in fact it is even more complicated because you have to deal now with IDE specific settings. Often you are forced to use a specific editor which is part of that IDE instead of the editor that you like. Compiling with one button click can also be achieved by using Makefiles. In the end it is a matter of personal taste. If you like it then use it. Here I will however show you how you can have a comfortable development environment which you will understand then tailor to your needs. The most important part of a development environment is the text editor. You want one that supports C-code syntax highlighting. http://www.crimsoneditor.com/ is a very powerful choice for windows. http://www.vim.org/ I like this one very much. It exists for Windows, Linux and Mac but you have to learn how to use it. Only after a couple of weeks training you will understand why I like it. http://www.gnu.org/software/emacs/windows/Getting-Emacs.html Emacs, a bit fat but very powerful and available for almost any system. Besides the editor you need a smart way to compile code. Maybe with just a mouse click or one command (if you prefer to type instead of clicking). This can be done by using a Makefile. AVR studio is an IDE specifically AVR software development. AVR studio is maintained by Atmel and it is available for Windows only. AVR studio has an editor, an assembler and a programmer. AVR studio has no C compiler. All you can do with AVR studio is call the external avr-gcc compiler. In other words if you want to program in assembler then AVR studio is quite OK but if you want to work with C-code then its value is very limited. AVR studio does not run on Mac or Linux. Makefiles are just text files containing rules on what to do if a file was updated. All the needed dependencies are then searched and the corresponding commands are executed. The lines after the target have to start with a TAB-character. You can not use space instead. The top most target in the file should be the main target (e.g ledtest.hex if that is the main thing you want to have in the end). The dependency1, dependency2, etc... are the ingredients you need to generate the target. So let's apply this to our case. To compile the code with a make file you just run the command "make" and make will search for a Makefile and try to built the top most target. You can also add more targets that do other things. To execute any target other than the top most you specifiy its name after the command make. All tuxgraphics Makefiles contain e.g a load target. You can say "make load" to compile and load the software into the microcontroller. Microcontrollers do not have a Bios where you could set some initial settings. Things that need to be there before the first line of code is executed are defined by Fuses. Those fuses are not like electrical fuses which you burn and destroy. It is just some bit pattern used for configuration. You can change it as often as you want. But be careful and read the datasheet frist. If you change the wrong bits then it can happen that the microcontroller can no longer be programmed. That means you can not undo the change anymore. If you download code from tuxgraphics then always check the README file that comes with it for the correct fuse settings. The software will generally malfunction if you do not have the recommended fuse settings. The above are the factory default settings for a new atmega8 chip running on a 1MHz internal clock. Most of the smaller AVR microcontrollers don't support any debugging features and I personally have never really felt the need for single step debugging or setting break-points. I think that the use of in-target debugging is often overestimated. There is a much easier and more natural way to write good code and find faults if they happen. A lot of it has to do with methodology. Try to keep the code structured. Put things that belong together into the same file. Don't use global variables outside the file where they are declared. Develop step by step. Write a small function then test it. Expand it and then test it. I never wite a large junk of code at once. If something does not work then take a break and afterwards read over the code. A microcontroller has by default no display. It seems difficult to guess where a fault might be because you can not easily add printouts. I put usually an LED in all circuits that I build and that is what I use to debug the code. It is very simple and it works very well. You can test if you run through a certain piece of code. You can add an if-statement testing a variable for its value and then switch on the LED. LEDs have also the advantage that they do not change the timing. Microcontrollers do usually directly interwork with other hardware. The timing is usually very important. Changing the state of an LED is not intrusive at all. It's a very good debugger. Code is usually not full of faults. There is usually one specific thing that does not work and therefore it is just a matter of narrowing down were the fault might be. An LED is good enough. What can be difficult to debug with an LED are large algorithms or operations on strings. Those things are however not hardware dependent. They don't need to run in a microcontroller. Copy/paste the function in question into a different file and then change it a bit such that it runs on your PC. Add printf all over the place and compile it (gcc -Wall test test.c). Now you can see why e.g a URL decoding function does not work, or an IP packet checksum is wrong,.... Any more complex algorithm can be analyzed this way. It works very well and is much better than a debugger. Many microcontroller circuits have eventually some kind of output. It might be an LCD display, a web page, a rs232 interface. Those can also be used for debug purposes. In general there is not much difference in writing C-code for a PC computer or for a microcontroller. The microcontroller is however just a very small computer. It is therefore important to not waste resources. I have never needed any bigger numbers. If you do some calculation then try to use integer math as much as possible. Datatypes of float and double really blow up the code. You can e.g use internally integers even if you want to represent one digit behind the decimal point. Only when you print it you would display it with a decimal point. The internal number 100 would then represent 10.0. An efficient way to convert an integer into a string for displaying on a LCD or a web page is the avr-libc specific function "itoa" (in stdlib.h). This can be used to convert 100 into the string "100". To add a decimal point is just a matter of adding '.' into the string one position before the end of the string. The atmega8 has a built in analog to digital converter. Here is how to use it. 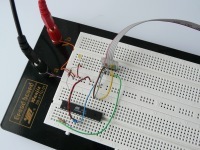 We use as a reference voltage the internal 2.56V reference. The ADC has a resolution of 10bit (1024). In other words an adc value of e.g 500 would correspond to: 500/1024 * 2.56 Volts. adlow=ADCL; // read low first !! Microcontrollers have built in timers and counters. In the first example with the blinking LED we used just the delay_ms function for the timing. That is OK if you don't do much other things but for more complex things you need something like an interrupt that gets executed periodically. To measure rotations per minute (RPM) you would use a counter. In defined time intervals you would read the counter and copy its value to a variable. That variable would then contain the rotations per minute. It is important to note that you must keep the code executed inside the interrupt short. E.g copy a variable or switch on/off something. You can however not use an interrupt to update a display. Display updates or web-page updates would be done from the main while(1) loop. Here is an example the does causes an LED to blink but it uses a timer. You can download the complete code at the end as avrledtest_timer. The corresponding datasheet chapter is "8-bit Timer/Counter2". /* setup timer T2 as an interrupt generating time base. With the function init_cnt2 we configure the timer. After that the microcontroller will automatically execute the function ISR(TIMER2_COMP_vect) in 20Hz intervals. Using a variable that counts up we can reduce the blinking frequency such that we get a nice blinking LED which goes on and off in 1sec intervals. Good user interface to microcontrollers are small character LCD displays. Using a small library we can easily print text or numbers. The full code can be downloaded at the end as avrlcdtest. The zip archive contains also a schematic drawing that shows how to connect the LCD to the microcontroller. The library has more functions e.g for clearing the display or writing individual characters instead of strings. This is just to get you started. Tuxgraphics has the source code available for all projects. You can take it and modify it to learn or expand it to implement your own ideas. Those little chips are very interesting and it is a lot of fun. article from 2004 "Programming the AVR microcontroller with GCC, libc 1.0.4", this is the grandfather of this new article.